The center of the Place is occupied by a giant Egyptian obelisk decorated with hieroglyphics exalting the reign of the pharaoh Ramesses II. It is one of two the Egyptian government gave to the French in the 19th century. The other one stayed in Egypt, too difficult and heavy to move to France with the technology at that time. In the 1990s, President François Mitterrand gave the second obelisk back to the Egyptians. The Axe historique is a line of monuments, buildings and thoroughfares that extends from the centre of Paris, France, to the west. It is also known as the Voie Triomphale. The Avenue des Champs-Élysées is an avenue in the 8th arrondissement of Paris, France, 1.9 kilometres (1.2 mi) long and 70 metres (230 ft) wide, running between the Place de la Concorde and the Place Charles de Gaulle, where the Arc de Triomphe is located. It is known for its theatres, cafés, and luxury shops, for the annual Bastille Day military parade, and as the finish of the Tour de France cycle race. Ange-Jacques Gabriel was the principal architect of King Louis XV of France. His major works included the Place de la Concorde, the École Militaire, and the Petit Trianon and opera theater at the Palace of Versailles. His style was a careful balance between French Baroque architecture and French neoclassicism. Edmé Bouchardon was a French sculptor best known for his neoclassical statues in the gardens of the Palace of Versailles, his medals, his equestrian statue of Louis XV of France for the Place de la Concorde (destroyed during the French Revolution; and for the Fountain of Four Seasons in Paris. He was also a draftsman and painter, and made s celebrated series of engravings of working-class Parisians. The hôtel de la Marine is a historic building on place de la Concorde in Paris, to the east of rue Royale. It was built between 1757 and 1774 on what was then known as place Louis XV, with a façade by Ange-Jacques Gabriel, First Architect to the King and designer of the square. The identical building to its west now houses the hôtel de Crillon. The Luxor Obelisk is a 23 metres (75 ft) high Ancient Egyptian obelisk standing at the centre of the Place de la Concorde in Paris, France. It was originally located at the entrance to Luxor Temple, in Egypt. The Luxor Obelisk was classified as a historical monument in 1936. The Fountains in Paris originally provided drinking water for city residents, and now are decorative features in the city's squares and parks. Paris has more than two hundred fountains, the oldest dating back to the 16th century. It also has more than one hundred Wallace drinking fountains. Most of the fountains are the property of the municipality. The Fontaine des Quatre-Saisons is a monumental 18th-century public fountain, at 57-59 rue de Grenelle in the 7th arrondissement of Paris, France. It was executed by Edme Bouchardon, royal sculptor of King Louis XV, and opened in 1745. The fountain is huge and richly decorated, but it had only two water spouts, and its grand scale on the narrow street, together with the lack of water, irritated Voltaire and other figures of the French Enlightenment. The Hôtel de Crillon is a historic luxury hotel in Paris which opened in 1909 in a building dating to 1758. 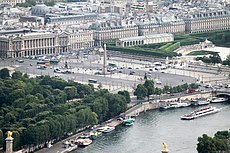 Located at the foot of the Champs-Élysées, the Crillon along with the Hôtel de la Marine is one of two identical stone palaces on the Place de la Concorde. It has been listed since 1900 as a monument historique by the French Ministry of Culture. Achille-Joseph-Étienne Valois was a French designer and sculptor who studied for a time in the atelier of Jacques-Louis David and whose sculptural works may be seen in Paris. He also studied with Antoine-Denis Chaudet. The Fontaine Saint-Sulpice is a monumental fountain located in Place Saint-Sulpice in the 6th arrondissement of Paris. It was constructed between 1843 and 1848 by the architect Louis Visconti, who also designed the tomb of Napoleon. The list of Paris fountains, existing and destroyed, is arranged by arrondissement below. Fountains in France provided drinking water to the inhabitants of the ancient Roman cities of France, and to French monasteries and villages during the Middle Ages. Later, they were symbols of royal power and grandeur in the gardens of the kings of France. Today, though they no longer provide drinking water, they decorate the squares and parks of French cities and towns. Milène Guermont is an artist.